Chemical Constituents and Components : Main components are methylxanthoxylin, corilagin, ellagitanins, ellagic acid and gallic acid, jambosine, volatile oil, jambolin, quercetin, ferulic acid, veratrole, guajacol and caffeic acid. Bitter: 1. It induces apoptosis in specific tumor cells. 2. It acts as antioxidant by protecting the cell from oxidative stress. 3. It is strong acid acting against reactive oxygen scavenging systems. 4. It reduces the blood sugar level in body. Volatile oil: 1. It significantly inhibites the growth of bacteria. Curing Diseases : 1. The fruit and seed of Syzygium cumini are used as antidiabetic agent by decreasing kidneys catalase activity. 2. This causes a significant reduction in serum glucose by regeneration of pancreatic islet cells. 3. It stimulates insulin secretion and eliminates risk of hyperglycemia and cardiovascular complication. 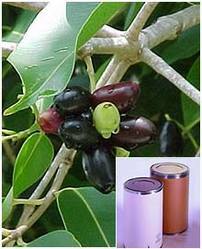 Possible Combinations : Syzygium cumini + gymnema sylvestre + momordica charantia (diabetes treatment).